be.HOTEL Malta is situated within the vibrant city of St. Julian’s, with a close proximity to Malta’s most coveted attractions. Offering a picturesque landscape with sandy beaches and sweeping views, St. Julian’s is also a hub for plentiful dining, historical, and nightlife destinations within its limits, offering the perfect blend of leisure and activity during one’s visit. When a traveler’s journey winds to a close, the international airport is located just minutes from the hotel. 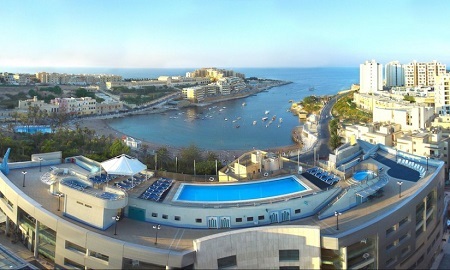 The charming city of St. Julian’s plays host to an exquisite luxury hotel, be.HOTEL Malta. The elegant four-star property is located within the Bay Street Tourist Complex, with a myriad of shopping and dining destinations just steps from the hotel’s front doors. Guests are also moments away from St. Julian’s premier attractions, from historical sites, to endless beaches at St. George’s Bay. Onsite, guests can indulge in a rooftop swimming pool with panoramic views, several dining establishments, and a tranquil spa. With 130 spacious guest rooms and luxury apartments, be.HOTEL Malta offers a myriad of deluxe amenities complemented by stunning décor, creating the perfect opportunity to explore St. Julian’s amid complete relaxation. be.HOTEL Malta offers a bistro dining concept and a range of restaurant outlets. Situated amid a bustling district, Baystreet Tourist Complex, the hotel is also just steps away from St. Julian’s premier dining destinations, promising a distinctive array of cuisine types available to meet each guest’s unique preferences. With contemporary accommodations and deluxe amenities, be.HOTEL Malta invites travelers to relax among any of its luxurious 130 guest rooms and apartments during their stay. 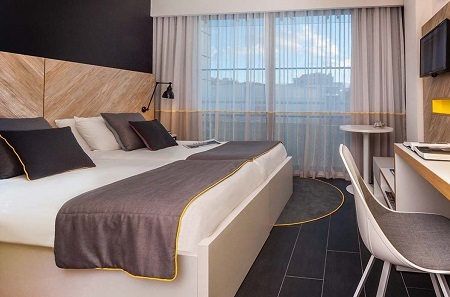 Designed with an innovated concept in mind, each guest room offers modern aesthetics and comfortable furnishings, including a spacious private balcony. Each room features elegantly appointed bathrooms, a flat-screen HD television, and a fully-stocked minibar, with an option to indulge in an additional package that includes complimentary WiFi, in-room hot beverage machines, and luxurious robes and slippers. Offer is based on single or double occupancy in a Deluxe room accommodations.